Will Europe Stand Up to American Pressure? Europe has decided to assert its independence: it will not revise its agreement with Iran and will not comply with US sanctions. When Washington tore up the Iran deal, that was the last straw for the European Union. In reality the EU had nowhere left to retreat — any further capitulation to the Atlanticists’ dictates would render the entire pan-European project meaningless. 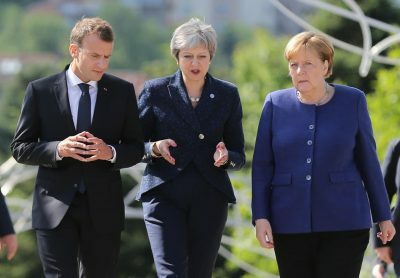 Will May 2018 prove to be the turning point, the moment when the West’s unity began to fracture? On May 17, 2018, the leaders of the countries of Europe, together with senior officials from the European Union, gathered in Sofia, officially to discuss their relations with the Balkan countries that are candidates for EU membership. But how could there be any talk of expanding the EU if it is unable to manage its primary mission — protecting the interests of Europeans? Thus it is unlikely that the conversation at that informal dinner in the Bulgarian capital was about anything other than their relations with the US, because Europe is on the verge of not just a trade war, but a geopolitical conflict with its … Well … with its what, exactly? Its senior partner? Ally? Suzerain? Competitor? In geopolitical terms, the US is without question the boss over the Old World — under the auspices of a unified West and NATO, it is the American Atlanticists who hold the higher rank. After WWII, the US used various means of control to seize the reins in Germany, Italy, France, and other countries in Western and later in Eastern Europe. Great Britain partnered with them to help keep Europe under control, and since then — despite any differences that may have arisen between the two shores of the Atlantic — Europe, even in the form of the European Union, has generally remained their vassal. As the project to integrate Europe gained momentum, continental Europeans felt a growing desire to become more independent, but Washington and London always kept that situation well in hand. 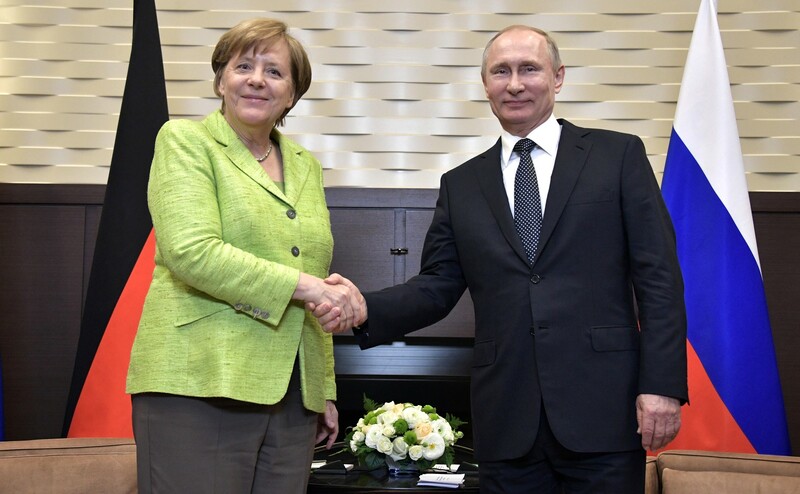 Germany’s genuine autonomy and especially its rapprochement with Russia has clearly been at odds with the interests of the Atlanticists — and a few years ago, under the pretext of a “Russian threat,” Europe knuckled under to the anti-Russian sanctions. The majority of Europe’s political class understood that it was beneficial for the EU to have close ties with Russia, and they have always been looking for a chance to end the confrontation with Moscow. In order to perpetuate the atmosphere of Russophobia, the Anglo-Saxons even resorted to staging the provocation with the Skripals, so as to somehow preserve the tension between Russia and Europe. It seemed that Europe would remain under their thumb for the immediate future. Europe’s leaders will wait to see how the power struggle in the US ends and will try to simultaneously accommodate themselves to both Trump as well as to the Atlanticist elite that opposes him. However, recent actions by Washington seem to have prompted some major changes. Trump needed the dissolution of the Iran deal largely for domestic political reasons, but he was prepared to lean particularly heavily on the Europeans. In accordance with his plans, the Europeans needed to agree with the US to compel Iran to draw up a new accord that could be presented as a major victory to the American public. Trump did not take into account the individual positions of Russia or China, which would in any case be against a revision of the deal. Apparently inspired by the imaginary success of his Korean offensive (in which Beijing and Pyongyang created the illusion of a breakthrough for him), the US president decided that everything would work out fine in this matter as well. To encourage the Europeans to be more amenable, they were threatened with sanctions. But the Old World balked outright and decided to preserve both the deal as well as its relationship with Iran. And the aftermath of the US pressure on Europe over the Iran deal will now extend far beyond just a run-of-the-mill misunderstanding between allies. “Looking at the latest decisions of President Trump, someone could even think: With friends like that, who needs enemies? But frankly speaking, Europe should be grateful to President Trump. Because thanks to him we have got rid of all illusions,” stated the chairman of the European Council, or in other words, the president of united Europe, Donald Tusk on May 17, 2018. So as it turns out, Europe is not only ready to shoulder the responsibility for its own future — something which even Angela Merkel has been speaking about for the past year, which includes providing for its own security — but is also ready to replace the US as a world leader! Did we actually hear this correctly? Yes, that’s right. In fact, they started talking about this in Europe immediately after Donald Trump won the election more than a year and a half ago. Even then, Trump was declaring that America should focus on itself and not on the construction of a unified Atlanticist world, and that for the sake of filling America’s coffers he would shake down all its partners, enemies, and allies. Europeans, who have grown used to wielding only limited sovereignty in matters of war and peace, were suddenly being told that they needed to pay for being protected by the US, because Trump’s America saw that umbrella as something expendable. The West’s unity began to fracture. And although the Atlanticist elite on both sides of the ocean hope that Trump turns out to be nothing more than a bad dream and that everything will go back to normal in 2020, the reality is that there is no way the West can regain that indivisibility. America will rewrite its foreign policy with the goal of “making itself great again,” regardless of whether or not Trump is in power, because the hegemon has cracked and America’s more nationalistic elites are seizing power from the ones who have been playing at being the world’s policeman. What is left for the Atlanticists? Should they make their peace with this or attempt to shift the Western world’s center of gravity toward Europe? But are there any political figures in Europe who are capable of taking the lead? They tried to audition Merkel, but she refused to bite. Tusk or Junker? Macron? They’re all wrong. There is no solution — and in this environment, relationships among the Western nations are evolving the way Trump wanted: into a battle between national states. Trump sees the EU as a competitor and he wants to weaken it. When it comes to the Iran deal, what’s important isn’t even that it’s about Iran, around which Germany and France have constructed big economic plans, but rather that Europe is simply being ordered to abandon the idea of protecting its own interests. And also that this is being done under an utterly contrived pretext. Unlike the introduction of the anti-Russian sanctions, there are no reasons whatsoever for tearing up that deal, not even nominal ones. And the ones talking this way aren’t just those who have spent the last few years reminding Europe that it is harming itself by bowing to Washington’s pressure and keeping the anti-Russian sanctions intact. Now this is the argument being made even by the hardliners on Moscow — the reliable Atlanticists. “This is nothing less than a massive assault on the sovereignty of European states and the European Union. They are deprived of their right to decide on their policies and actions by brutal dictates from a foreign — and allegedly friendly — country. This is utterly unacceptable from a European point of view, as well as a violation of the preaching of Trump himself. It relegates Europe to just abiding by and implementing policies with which it profoundly disagrees,” writes former Swedish Prime Minister Carl Bildt in the Washington Post. Europe cannot cave in to US pressure, but it cannot realistically break ties with Washington when rejecting it, much less lay a claim to the mantle of global leadership. Europe simply wants more independence, which is already asking a lot, given the current state of world affairs. To achieve this, Europe needs to develop a more favorable balance of forces and interests, and when seeking out the building blocks for this, it naturally turns its gaze toward Moscow. It just so happens that within a week the heads of half of the world’s most powerful countries — Germany, France, Japan, and India — have visits to Russia. Angela Merkel and Emmanuel Macron were initially planning to talk to Vladimir Putin about a variety of topics: Syria, trade, Ukraine … But now everything will revolve around the word “Iran,” which signifies much more than just a country or a deal. It is rather the choice that Europe is making as we all watch.